Abstract. Zimbabwe's water resources are under pressure from both point and non-point sources of pollution hence the need for regular and synoptic assessment. In-situ and laboratory based methods of water quality monitoring are point based and do not provide a synoptic coverage of the lakes. 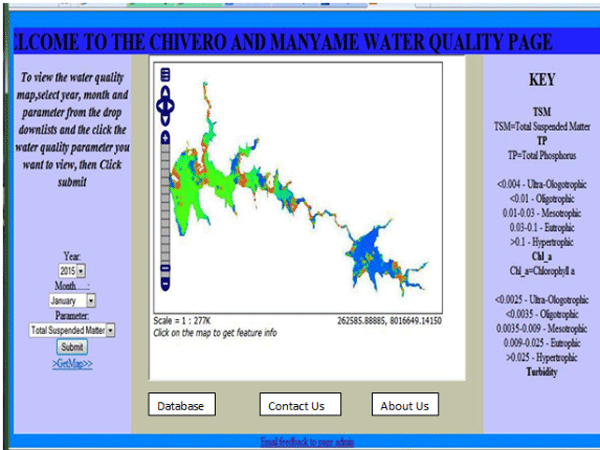 This paper presents novel methods for retrieving water quality parameters in Chivero and Manyame lakes, Zimbabwe, from remotely sensed imagery. Remotely sensed derived water quality parameters are further validated using in-situ data. It also presents an application for automated retrieval of those parameters developed in VB6, as well as a web portal for disseminating the water quality information to relevant stakeholders. The web portal is developed, using Geoserver, open layers and HTML. Results show the spatial variation of water quality and an automated remote sensing and GIS system with a web front end to disseminate water quality information. 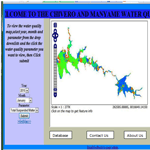 How to cite: Muchini, R., Gumindoga, W., Togarepi, S., Masarira, T. P., and Dube, T.: Near real time water quality monitoring of Chivero and Manyame lakes of Zimbabwe, Proc. IAHS, 378, 85-92, https://doi.org/10.5194/piahs-378-85-2018, 2018.